Also known as Moshesh, Mosheshwe or Mshweshwe. His name was allegedly changed from Lepoqo after a successful raid in which he had sheared the beards of his victims – the word ‘Moshoeshoe’ represented the sound of the shearing. In 1820 Moshoeshoe succeeded his father, Mokhacane, as the chief of the Bamokoteli. His first settlement was at Butha Buthe, but he later built his stronghold at Thaba Bosiu (Mountain of the Night). He united various groups of refugees during the Shaka wars, a period known as the ‘mfecane’ or difaqane (1813-1830), into the Basotho nation. From his capital at Thaba Bosiu , he warded off attacks from many enemies, including Shaka’s Zulus and Mzilikazi’s Ndebele. In 1833 he encouraged missionaries from the Paris Evangelical Missionary Society to come to his kingdom, and so brought the Basotho in contact with Christianity. Moshoeshoe himself is said to have converted to the faith at the end of his life. From 1836 he came into contact with the Voortrekkers who settled in what is today known as the Free State, and then reached several territorial agreements with the British, who had taken over possession of the Free State territory in 1848. Border disputes nevertheless led to battles between the Basotho and British forces in 1851 and 1852, both of which were won by the Basotho. In 1854 the Orange Free State (OFS) became an independent Boer republic. As with the British, border conflict broke out soon afterwards. After a Basotho defeat in 1868, Moshoeshoe asked the British for protection. Basotholand became British territory, but Moshoeshoe still managed to preserve his kingdom and his people’s existence. After the British signed the Treaty of Aliwal North with the OFS, the border dispute was settled. 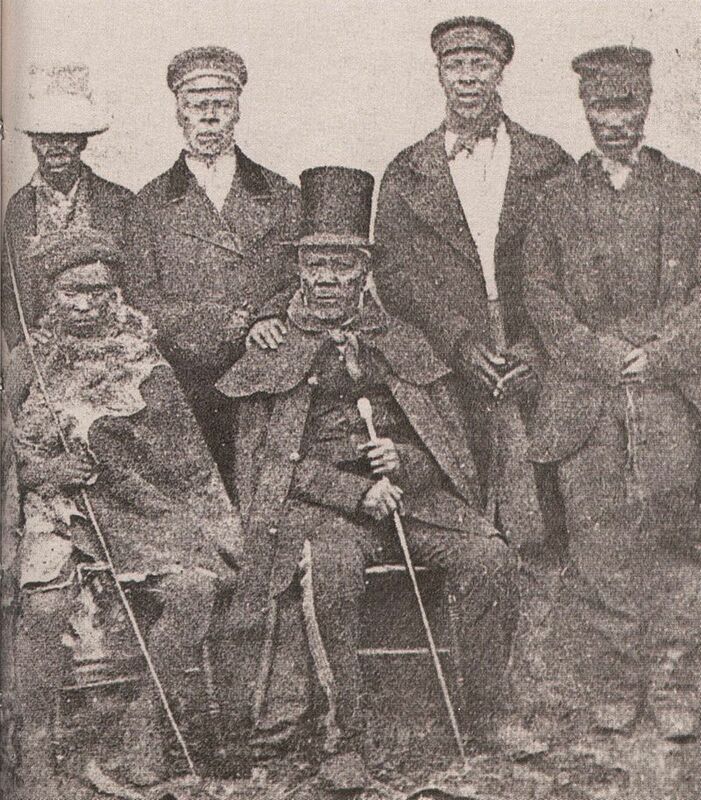 Moshoeshoe died in 1870 and a year later Basotholand was integrated with the Cape Colony. However, in 1884, it became a separate British Protectorate. In 1966, Basotholand gained its independence and was renamed Lesotho. A great-great-grandson of Moshoeshoe, Archbishop Emmanuel Mbathoana (1904-1966), became the first Black bishop of the Roman Catholic Church in Southern Africa. He was the archbishop of Basotholand from 1952. Another great-great-grandson, Moshoeshoe II, became the king of Lesotho after independence. King Moshoeshoe or Moshesh of the Basotho people of Lesotho. Photo from the Nineteenth Century. • Potgieter, J. (ed)(1972). Standard Encyclopaedia of Southern Africa, Vol. VII, Pretoria: HSRC, pp. 544-5.